Make Full Use Of Your Inked Finger By Getting Free Food From These 5 Places Today! Today is THE day for all Malaysians to practice our rights as a citizen. If you’re one of those who woke up extra early just to get in line and cast your votes, good for you because you can now fill up your tumtum at these places for absolutely FREE! P/S: Only eligible to those whose finger marked with indelible ink! 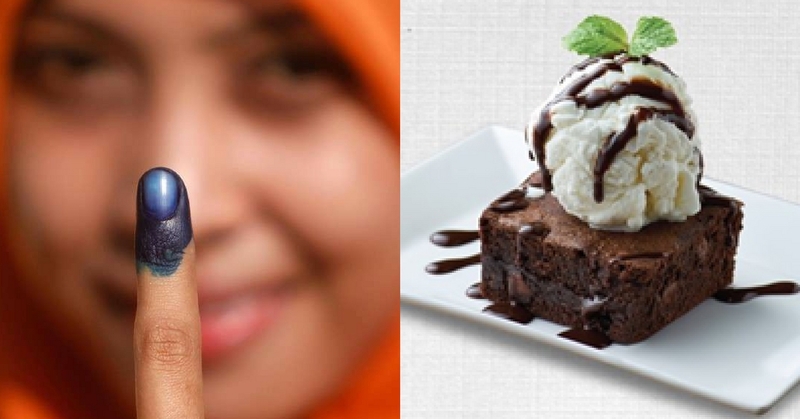 Vote, show us the finger (inked) and get a FREE Brownie at all outlets nationwide! #PulangMengundi #GE14 #DavesDeli . *Only available on 9 May 2018. Customers must present their inked finger from voting to complete the redemption. Dine in only. For the first 100 customers per outlet. Limited to one (1) brownie per voter. While stocks last. Please take note that these FREE food are only available while stock last so if you won’t be getting off from your polling station anytime soon, you can always fall back to some good ol’ instant noodles.